Levi Strauss & Co. encourages employees to take five hours a month of paid time to volunteer in their communities. Here’s how Kyle Rudzinski is using that time. People at our company love giving back. We rally behind philanthropy, volunteering and civic responsibility. And yet, when I speak with colleagues, I often hear that not everyone uses their monthly five hours of paid volunteer time. I get it. I hadn’t used mine much either until recently. We all work hard, and it’s easy to skip taking five hours each month to volunteer. Near-term work priorities can get in the way. Plus, sometimes it takes longer than half a day to feel like your efforts made a difference. That’s why, recently, I took advantage of a company policy that allows us to roll over our monthly volunteer hours for use on volunteer immersion experiences. Connecting with the land more directly always revives my spirit. So in September, I devoured some soul food by volunteering for a week through Worldwide Opportunities on Organic Farms-USA. WWOOF-USA is like Airbnb, but with farmers. Its farm map makes it easy to find the right place to offer help in exchange for room, board and an unforgettable experience. That’s how I found myself in a remote cabin without running water in an old growth forest at the edge of the Kenai Peninsula in Alaska. My experience was more foraging than farming. 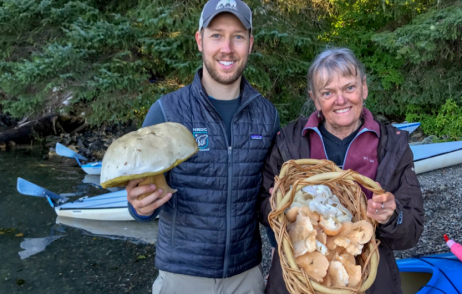 My delightful hosts, Rick and Dorle Harness, taught me how to spot chicken of the woods, puffballs, angel wings, and hedgehogs (all edible mushrooms). We kayaked across the bay to recover floating bullwhip kelp, a super food. We plucked oyster leaf, arrow grass and goose tongue from rocky beach coves for soups. We spent hours collecting wild blueberries and salmon berries. We collected drinking water from a nearby waterfall in a couple dozen buckets. They showed me how to use bladder wrack (an algae) as an anti-inflammatory ointment and how to transform the prickly devil’s club plant into a salve. Between foraging sessions, chopping wood and scraping barnacles from boat hulls, I listened to their wealth of local knowledge. A community activist, Rick led a jet ski ban for Kachemak Bay and helped set up the primary sea otter rescue after the Exxon Valdez oil spill. Dorle knows all of ebbs and flows of intertidal species and can explain how bald eagles recovered from the brink of extinction. Together, they educate visitors about their local ecosystem and low-impact living. I came back refreshed and energized after taking time out to serve others.